You are here: Home › FSF Appeals › 2011 › We want to do more for you! We want to do more for you! Help us raise $300,000 for free software by January 31st. With your support this past year, we made a difference and accomplished a great deal for free software around the world. But we don't just want to repeat this in 2012 — we want to make an even bigger impact, and we need your help to do it. To reach our fundraising goal, we need to raise just $229,000 more over the next seven weeks. If we meet this goal, we will be confident that our existing program expenses will be covered for the remainder of the year, and we can focus on how best to start doing more. You can help us get there by joining — an FSF membership is $120/year, which is $10/month or 33 cents per day. Note that while you can contribute $10 or more automatically each month, we cannot yet automatically collect your 33 cents each day. The FSF is a small, humble organization of passionate individuals working tirelessly for our software freedom. Last year we helped arrange over 110 events around the world, including our annual LibrePlanet conference. We responded to well over 14,000 email requests from our members, reporters, and the broader public. We gathered tens of thousands of signatures, and broke stories on computer user freedom into the mainstream media. We helped people learn about getting started with free software, and ran educational advocacy campaigns about the efforts of major corporations to eliminate free software. We took in over 100 new copyright assignments for the GNU Project, replied to over a thousand free software licensing questions, and provided important distribution and development infrastructure for GNU hackers. We offered feedback to organizations and standards bodies, and gave guidance on legislation and policies being enacted around the world. We run a store and publishing company out of our office, shipping freely licensed books, printed t-shirts, and stickers to dozens of countries. But we want to do more — a lot more. And the only way that can happen is if you help us grow. The Free Software Foundation is a staff of ten dedicated and effective individuals, working with a global network of volunteers and supporters of the free software movement. Our president, Richard Stallman, does not receive a salary from the FSF. Every person and function in our organization is pushed to its capacity, and to do more, we need to grow. Between now and the end of our fundraiser on January 31st, we will be presenting you with a series of short focus pieces detailing our work and our desire to do even more for you! 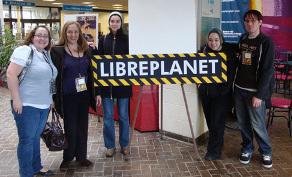 FSF associate members at the LibrePlanet 2011 conference. The goal of our fundraiser is to raise $300,000 for free software. Our goal as an organization is to spend your donations wisely and effectively, so that we can do our very best on your behalf at defending the rights of computer users around the world and encouraging free software development. PS. If you are in the US, please call your representatives this week to stop the Internet blacklist legislation, SOPA, from becoming a law!